It's what employers CAN'T teach you that makes you more valuable. Now, you might be thinking: "I have all those, why aren't recruiters knocking down my door?" There are two reasons why you may not be getting recognized for your soft skills. #1 - The Dunning-Kruger effect. It turns out, some people tend to over-estimate their abilities. Named after David Dunning and Justin Kruger of Cornell University, research proves many people fail to adequately assess their level of competence -- or specifically, their incompetence -- instead considering themselves much more competent than everyone else. This lack of awareness is attributed to their lower level of competence robbing them of the ability to critically assess their own performance objectively, leading to a significant overestimation of their skills and abilities. #2 - Failure to market your skills. For those adept at the skills above, failure to get noticed for them could be due to a lack of marketing. Today, everyone is a business-of-one that must find a way to showcase their unique brand so they can earn trust and respect. However, given bragging is widely unaccepted in our culture, it can be hard to find a way to share accomplishments without coming across wrong. The solution is to get third-party credibility for your soft skills. For example, on LinkedIn you can receive both endorsements and recommendations from peers that provide an opportunity for your soft skills to be highlighted. And, learning how to showcase your soft skills in an interview without sounding like a narcissist can have the greatest impact on your ability to get hired. 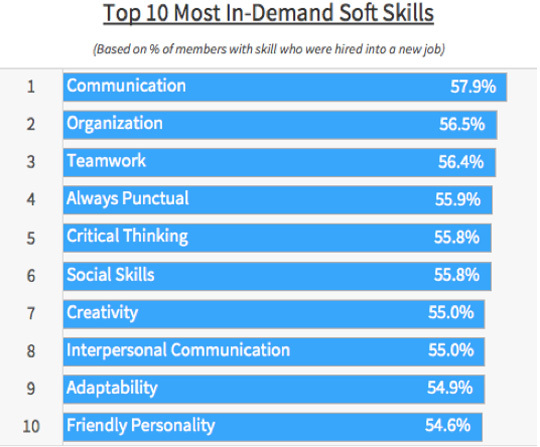 The key is to recognize that soft skills are not always easily seen by others. Which means it's up to you to master the right way to have them shine through. Not sure how you rank? Ask! A constructive conversation with your manager around these ten soft skills and how well she or he feels you perform them can help you understand where there's room for improvement. Given how in-demand these skills are, doesn't it make sense to get on the same page as your boss so you can exceed expectations and become even more valuable to the organization? In a time when every job is temporary, it's up to you to ensure you're seen as an asset to the organization. Improving your soft skills could be the ticket to greater career security and opportunity.